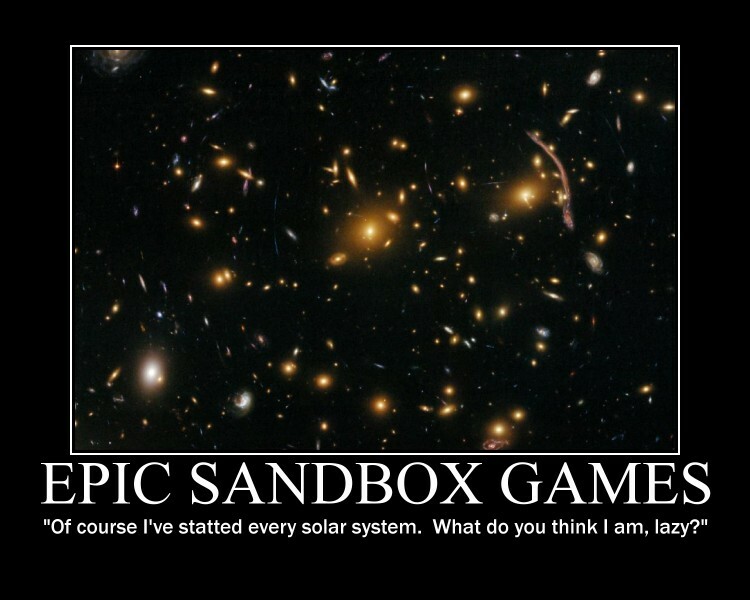 Wombat's Gaming Den of Iniquity: Schrödinger's Gun GMing: Who'd want to arm a physicist? Schrödinger's Gun GMing: Who'd want to arm a physicist? Welcome to the introductory article in the Schrödinger's Gun GMing series! I intend to describe one possible approach to GMing that works for me. Any implication that this method teaches the One True Way To GM is purely in the mind of the reader, as it will not work for everyone. No single method will. I only hope that you find an idea or two that speaks to you and leads you to improve as a GM. Please steal these ideas and use them in your home game. I'd love to hear about how these ideas worked or didn't work for you, so feel free to comment and I promise to respond. If you want to expand on these ideas in your own blog, do so but please link back here. I'm an improvisational GM more than a planner, so I tend to fly by the seat of my pants when running a game. 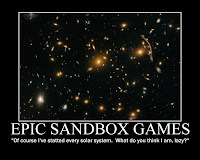 However, trying to run a long-term plotline in a sandbox environment presents huge challenges. How do you hook together scenes into a cohesive story when you run with an idea a player shared with you five minutes ago? If you tend to excel with planning and other design-time tasks as a GM, the situation seems even more bleak. What if the characters decide to punt the whole quest and head to the arctic tundra to build an Ice Castle? Sure, you can fall back on your social contract and break the fourth wall. "You see a blinding white plain cris-crossed with a gridwork of blue lines," has worked for me, though it's far from elegant. How do you get the best of both worlds? How do you make a solid story arc out of short-term improvisational scenes? How do you plan for your players taking a hard right away from your prepared plotline and into Left Field while keeping the arc intact? Enter Schrödinger. And His Gun. Let's deconstruct Schrödinger's Gun so we have an idea of what it means. Schrödinger's Gun mashes together two other tropes: Schrödinger's Cat and Chekhov's Gun. Schrödinger's Cat (TV Tropes link) tells us that anything not directly observed exists in a weird "Yes To Everything" state. In the now-classic gedankenexperiment, Schrödinger takes a hypothetical cat and puts it in a hypothetical impermeable box. Then he puts a randomizer in the box that may or may not break a vial of poison to kill the cat, and he seals the box. He posits that the cat is both alive and dead until we open the box to discover in which state the cat actually ends up. Schrödinger doesn't think about the mess in the box that'll need cleaning in either case, but it's a gedankenexperiment with impossibly ideal conditions and thus a forgiveable oversight. 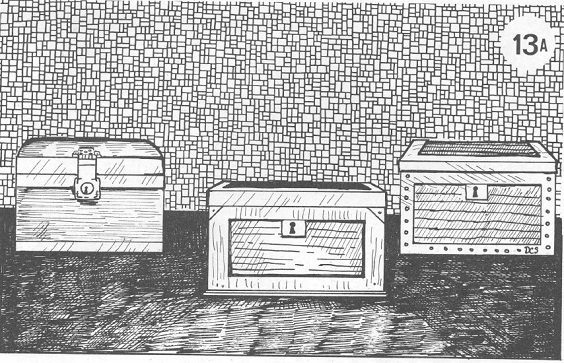 In gaming, you will have an infinite number of outcomes in your hypothetical box, all equally and absolutely true, but none of them become real until the PCs experience one of those outcomes. The glory of playing an RPG happens when the game future has no strings attached. Everything is possible, but nothing becomes real until it happens during the course of the game and adds to the PCs' story. In short: Observation and experience define reality. 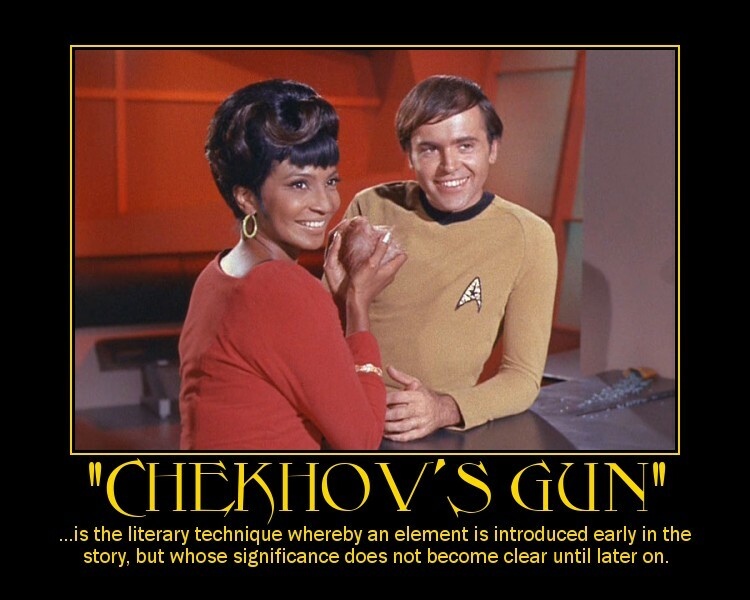 Chekhov's Gun (TV Tropes link) tells us that once an element enters reality it needs to be used. If Chekhov wrote a stage direction referencing a gun on stage in Act I, he would make sure to fire it before the end of the play. In my mind, you don't need to actually fire the gun, but you must use it in some way - as a threat, as a flashback story, as a crutch making a literal Swords to Plowshares story, whatever. This trope snuggles closely with foreshadowing as seen and overdone in many mystery TV shows today - the insignificant character introduced early on gets unmasked as the mastermind behind the whole crime at the end of the show. I think Chekhov meant it as "don't include unnecessary elements in your story," but the interpretation has gotten more liberal over time. In game terms, when something enters your story it needs to mean something at some point. A nameless NPC who gives false directions when the PCs first arrive in town could be the head of the local Thieves' Guild. Or an insane priest who survived the Catacombs of Madness and snapped at the loss of everyone else in his party. Or she could control the trade caravans in and out of town and the party needs to deal with her to get work as caravan guards. Or she's very well connected and tweets out that there's fresh blood in the compound so every hustler puts a target on the party. In short: No detail remains insignificant or irrelevant for long. In mashing these two concepts together, you can change the meaning of anything unrevealed to the PCs to alter or support the story. The faceless NPC demonstrates this beautifully. You introduce someone to give directions. The party treats that person poorly. Later the party needs something from the town, but you decide to complicate their lives by "promoting" the nameless NPC to the head of the town guard who happened to be off duty when the party arrived. No harm, no foul, just a nice twist for the PCs to deal with at a cost of merely updating your notes about the town. The nameless NPC was just an extra until you decided to change that person and use the previous interaction with the party to add something significant to the story. Once the PCs experience something, you can't change it or you drift into retcon territory. You can change why it happened or how it happened or what a person does for a living if the PCs haven't discovered that information yet, but once something is revealed it needs to impact the story in some way. Not all impacts need to shake the foundation of your campaign, but it needs to mean something to the party. Schrödinger's Gun has been called RailSchroding because of the ability to make the story go where you want through behind-the-scenes manipulation and alteration of unknown information. The classic case of this takes the main plot and has it follow the party to pop up as a result of any crazy choice they make. There's only so much you can get away with by claiming "It's destiny," and sometimes the players need a break, especially if your main plot threatens the world in a deadly serious way. I'll try to steer clear of situations like this, but RailSchroding can rear its ugly head using this approach. Avoiding it requires some GM attitude adjustment, which I'll cover in a future article. In short: You can't change what the party knows, but you can change anything the party hasn't experienced or discovered yet. Why Call This Thing Schrödinger's Gun? Over a year ago, I read The Angry DM's series of articles about Project Slaughterhouse. If you haven't read it, Project Slaughterhouse sits between encounter design and campaign design, and gives you a way to deal off as many encounters as you need in a specific environment, then allow you to change the character of the environment when the virtual encounter deck runs out. So if you're fighting kobolds in the sewers, sooner or later you're going to run out of kobolds to fight and something else will move in to fill the void they left. It's a very cool approach designed for use in a city or other contained area with several zones containing factions vying for control of the area. And it totally rocks as an environmental management tool. But can it be adapted to function as a story management tool? In Project Slaughterhouse Angry refers to Schrödinger's Gun, and the concept and name completely stuck with me. I asked for permission to expand on his ideas and use the name. He told me that he got it from TV Tropes and to feel free to use it. I hope to do well by him, even if I'm not explicitly designing a way to pull off a TPK every game session. I'll also adapt and extend the idea of the 5x5 Design Method created by DaveTheGame to provide a framework for story elements. There may be other ideas and methods out there that fit well with Schrödinger's Gun GMing, and I'll refer/link to them as they come up in context. I may end up doing a link page/bibliography as well. If I can borrow a shoulder from giants such as these, I think we'll end up with a decent system. Here's the thing: a GM requires a certain amount of grey area to operate effectively. If every detail has been defined and prepared in advance, a computer would do a better job of adjudicating the game because a flesh-and-blood GM would spend every session looking up details. If you start with a blank slate, you'll need to invest so much work into creating your baseline game that you won't have the time or clarity to create deep story lines - story depth takes time to layer events and a story that reaches back into your game world's history to really pull off. There's a middle ground that will let a GM prepare to improvise and create a great game using a balanced approach. That's where I want Schrödinger's Gun GMing to live and thrive. I hope this introduction has whet your appetite for more details about Schrödinger's Gun GMing. Please stay tuned for ideas you can actually use in play. And if you have a question about how to apply Schrödinger's Gun, get in touch, and if you're willing I'll use your situation as a case study in a future article. very good write up here. i'm kind of struggling with this myself currently, but not because of attitude...more because of time constraints. most of our sessions are 2.5 hours long on a weeknight biweekly, but its either that or we only play once every 2-3 months. every now and then (like 2 weeks from now) we get a "marathon session" that lasts until everyone is too tired to play :-). That's a great point - maybe I can touch on usage for gaming groups with severe time limitations like yours. I'll chew on that for a while. I started noticing I was getting uptight when running games, so I started paying attention and letting things happen without so much involvement from me. I'm still refining, so come back and see how the experiment is progressing. Another way to deal with gaming PCs are building one yourself,go right here or having one worked for you. This is an approach to ensure that you end up with precisely the PC that best fills your requirements. This will guarantee that your well deserved cash does not achieve the fake hands and you won't be denied of a definitive gaming encounters anytime of time.